I herniated a disc in my L4-L5 in mid-December 2010 – unfortunately I still don’t know how it happened. That's right folks! I hurt myself and have no idea how it happened. The "oh my God" pain set in while on a walk with Laney (she was still an adorable puppy that we had only had about a month) on December 11. I bent over to pick up her present for me and a shooting pain went through my lower back and left leg. I was working for the Cubs and immediately called our team doctor. Thank goodness I had that man on speed dial. He assured me that I could go to the Patriots-Bears game the following day because it wouldn't damage my back anymore (Phew!) but I would have to see another team specialist on the Monday. What followed was a 6-week endeavor of doctor's appointments, MRIs and physical therapy. It was a herniated disc and we were going to try physical therapy to see if we could help ease the pain. The biggest pain (besides in the back of course) was coursing down my left leg - sciatica. The herniated disc was not only pinching a nerve, but cutting it. It left me with little to no strength in my left leg and a series case of dropfoot. Which meant no working out. I was officially off the work out train and not happy. Okay maybe I snuck in a 5k on New Year's Day 2011 - but the wife made sure I walked the whole thing ... nice and slowly!! I started my weight loss journey in November 2009 and was picking up some serious steam by this point. I was nervous that without my workouts my weight loss would stall or go in the opposite direction. Thankfully I had Weight Watchers on my side. Even if I couldn't work out or really even walk more than to work, I could count Points. And count I did. I measured every little thing that went into my mouth. The physical therapy didn't improve the situation. I was offered a cortisone shot, but it wasn't covered by my insurance. A "possible" solution would've run me over $4k. It wasn't guaranteed to work and I didn't want to take that risk. So on Monday, January 24, 2011, I walked into my doctor's office, the doctor told me the herniation had gotten worse and I would be on the table for surgery on that Friday. Woah! That was hard to take and I immediately started crying. I was nervous. I knew it was a big risk, but it had to be done. Thankfully my dad had a lot of vacation time available and was on the next flight he could take out of Boston to be there to help the wife. Time passed quickly and on January 28, 2011, I had a microdiscectomy. It was tough, but the pain subsided immediately. Like literally immediately. :P I awoke from surgery and the pain was gone from my leg. I could wiggle my toes and they weren't getting caught on the sheet. That meant I had enough strength to control my toes. Hallelujah! I was in the hospital for observation for 23 hours. When I finally got to my room, my wife and dad told me the surgery actually took almost three times as long as he had expected. The disc had gotten that bad and had cut a larger slit in my nerve than they thought. Wow! I was happy to be hearing that while in recovery. I headed home to start recooping. The excitement at first was being able to walk around the apartment ... then to work ... then for 30 minutes on the treadmill. I finally got the go-ahead to go back to stationary bike at the beginning of May 2011 and returned to running in June 2011. I listened to everything my doctor and physical therapist said to do because I wanted to return to activity as quickly as I could. Between mid-December 2010 and May 2011, I managed to lose 10 lbs. I was ecstatic. I followed the Weight Watchers plan and still lost. I lost while laid up from an injury. Woo! I felt like a million bucks. The doctor wasn't sure I would be able to run again because of how the sciatica lessened my strength in the left leg. I started back running in June 2011 and completed a half marathon in August 2011. I felt amazing. I took the training and tweaked it for my body. I made sure to listen to how my back felt and go from there. Since that fateful January I haven't taken movement for granted. I have celebrated this day with activity each year. and 11 triathlons (including 1 half ironman). Thanks to inspiration and motivation from each and every one of you I've been able to tackle some amazing challenges. To celebrate such an amazing anniversary and to follow my Boston Marathon training plan ;) I tackled 16 miles today. Since I've been experiencing some hip pain rather than meet with the group for the run, I went to the treadmill. I broke up the run over 4 trips to the treadmill - 4 miles each. I enjoyed 2 movies: Bee Movie and Hotel Transylvania 2 (both cute). It was a challenge, but I thought of my Stroke Heroes and that pushed me through. Especially my girl Gelcys of Runner Unleashed who puts in a ridiculous number of miles on the treadmill and pushes me to be a better person each day! Once the runs were over, the wife had dinner ready to go. Damn I am lucky that she likes to cook. 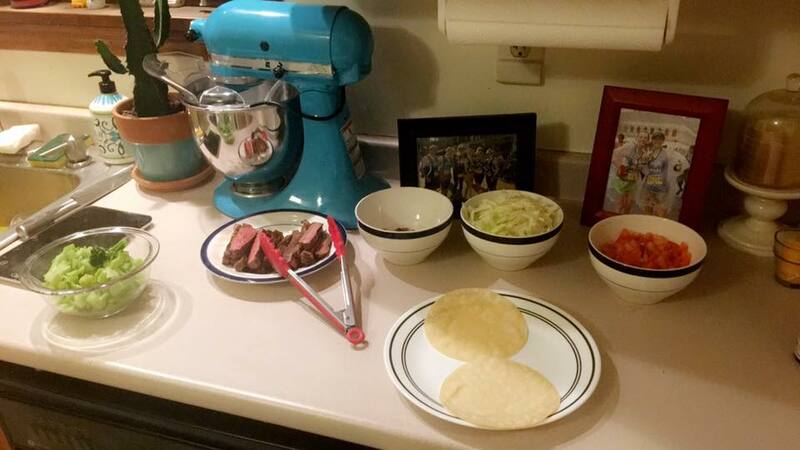 Tonight we enjoyed an old Weight Watchers recipe called Flank Steak Soft Tacos. 2 tacos = 7 SP. And they were DELCIOUS! I don't normally eat onion, tomato or cabbage, but I put them all of my taco and lived on the edge. ;) I bulked up the meal with some broccoli and was totally satisfied with one serving. This is a recipe we will definitely be making again! While today is always an emotional day when I think back to 2011, it is also one to be celebated. So please help me celebrate by making a donation to my 2017 Boston Marathon run to help me #FightStroke with Tedy's Team! Thank you for even considering!